*This is an honest review. 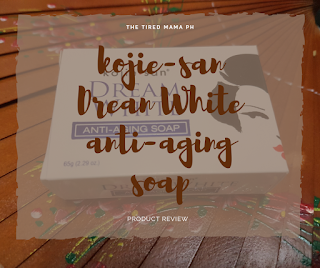 After I discovered Kojie-san Dream White Anti-aging soap, I was convinced to try out some of their products in the same product line. I needed an overnight cream. The more popular brands were either too expensive (in my opinion) or I had already experienced having a bad reaction from using it. 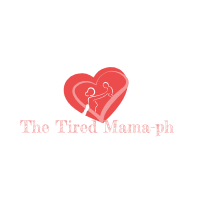 It's really frustrating after spending so much on one product and instead of helping you out with a problem like dry skin, you are faced by another problem such as contact dermatitis that can be an even bigger problem. In the past, I even bothered my little brother (he was studying for his USMLEs at the time) into buying me a night cream from the US that had many positive reviews. He laughed so hard when he saw that I was allergic. Felt like bad karma. LOL! So, to quell my curiosity, I went to my friendly neighborhood drugstore to see if they offered the Kojie-san Dream White product line and if I can afford it. Anyway, Yuri wanted to buy an egg of Kinder Joy (I swear, those eggs are expensive) so, we all set off on a mission to buy what we needed... in Yuri's case, what he wanted. After browsing through the aisles, I found the soap but, couldn't find any other Kojie-san merchandise. I was feeling a little disappointed because it meant I had to go downtown into the city to get it. All of a sudden, Yuri's father called me and said he found what I was looking for- the whole product line of Kojie-san displayed behind the glass counter of the pharmacy. I immediately asked for the overnight cream and to my relief, it only cost 165 Pesos (a little over $3 USD). I paid for it and the Kinder Joy egg that Yuri wanted. He was happy and I was happy. Now, to test this stuff out. 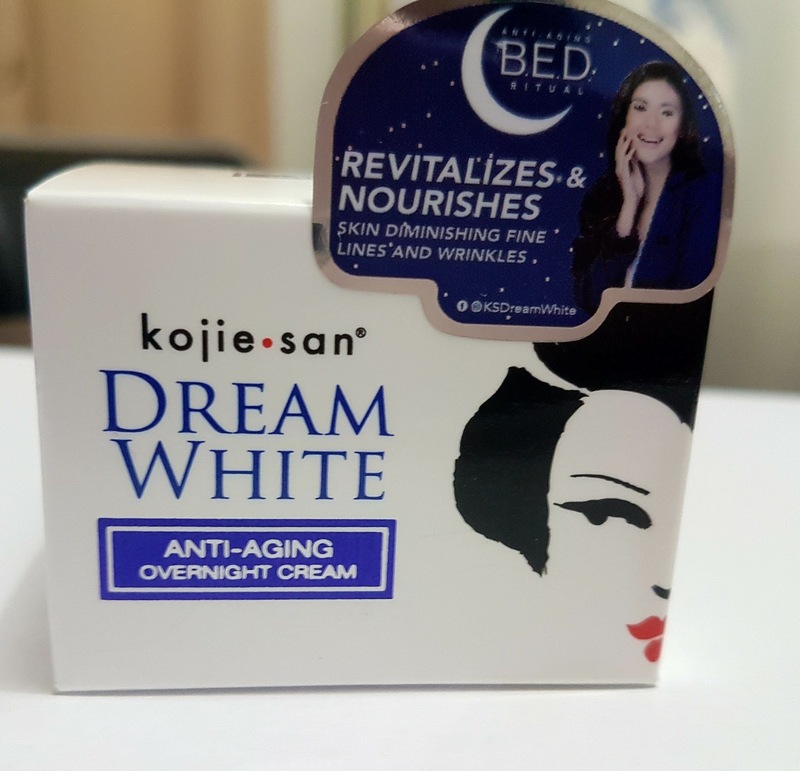 According to its packaging, Kojie-san Dream White Anti-aging Overnight cream is a concentrated moisturizer that helps revitalize and nourish skin during sleep. The combined effects of youth-generating properties of Milk Peptide Complex (MPC) and smoothing skin conditioners helps provide nourishing hydration and firmness to face and neck leaving skin smooth and radiant in the morning. It helps diminish the appearance of fine lines and wrinkles. This overnight cream is formulated from water, glyceryl stearate, ceteareth-20, ceteareth-12, cetearyl alcohol, cetyl palmitate, C12-15 alkyl benzoate, propylheptyl caprylate, dimethicone, polysilicone-11, decyl glycoside, butylene glycol, hydroxyethyl acrylate/sodium acryloyldimethyl taurate copolymer, squalene, polysorbate 60, C14-22 alcohols, C12-20 alkyl glucoside, honey extract, solluble collagen, hydrolyzed elastin, sodium PCA, serine, glycogen, cocogkycerides, phenoxyethanol, ethylhexyglycerin, tocopheryl acetate, kojic acid, glycerin, beta-glucan, whey protein, sodium hyaluronate, xanthan gum, fragrance, dipotassium glycyrrhizate, lactic acid, and sodium hydroxide. 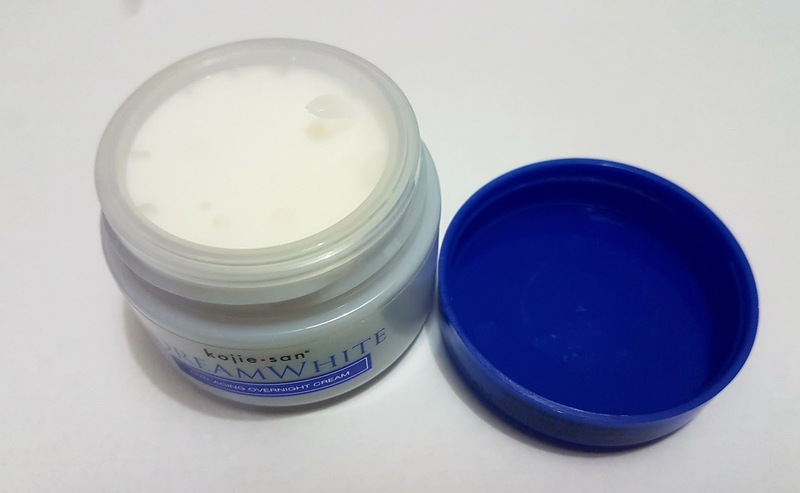 The Kojie-san Dream White Anti-aging Overnight cream comes in a white plastic container with a blue cap. When you unscrew the blue cap, you'll find a transparent cover that you have to remove before you can use the product. Basically, it's well sealed and the additional transparent cover prevents leaks. For 165 Pesos, you get 30g of the product. It has been 2 months, and I still have a little product left to finish. And yes, I have already purchased another jar. I bought it at SM Lanang for the same price. So,why do we need a night cream? Our skin does its repairing during the hours of sleep. Overnight creams are specifically designed to moisturize and penetrate the layers of the skin over the course of 8 hours while we sleep. These creams are usually formulated with a higher dose of vitamins and antioxidants as well as minerals and anti-aging compounds to restore, renew, and rebuild the skin while at rest. Many overnight creams include hyaluronic acid which provides extra moisture for hydration of the skin. What is Milk Peptide Complex and why is it important? Milk Peptide Complex (MPC) with an international nomenclature of cosmetic ingredients (INCI) name of whey protein contains the network of natural signal molecules of milk in their activated form which are protected by a physiological environment of milk components such as lactoferrin, lactoglobulin, lactoalbumin, lactose and other carriers. MPC reduces the visible signs of aging by reactivating skin cells and inducing the production of extracellular matrix molecules in the dermis such as hyaluronic acid, collagen Type I, and fibronectin. Studies have shown that skin regenerating formulations with MPC reduces wrinkles, makes skin firm and maintains elasticity improving structure of the skin. If you ever wondered why queens of the past bathed in milk, now you know. The use of Milk Peptide Complex is recommended for use in emulsified or gel-type skin preparations designed for mature skin and is intended for prevention of accelerated skin aging caused by environmental influences. So how does Hyaluronic Acid help the skin? While most acids usually act as exfoliants, Hyaluronic Acid (HA) is a natural and powerful moisture-binding substance. It delivers gentle hydration to where your skin needs it most. One gram of hyaluronic acid has the ability to hold up to 6L (litres) of water as well as the ability to regulate that moisture within the cells. Topically applied, hyaluronic acid helps hydrate the skin and maintain this hydration as a humectant (a substance used to reduce the loss of moisture). Since skin moisture can drop significantly as we age and since our skin is constantly exposed to environmental stressors, hyaluronic acid acts as the ultimate drink for our skin. It works for any skin type. Sodium hyaluronate is a salt derived from hyaluronic acid and is helpful in the same way that hyaluronic acid is for skin but, with one extra advantage: the skin absorbs sodium hyaluronate more easily than hyaluronic acid. 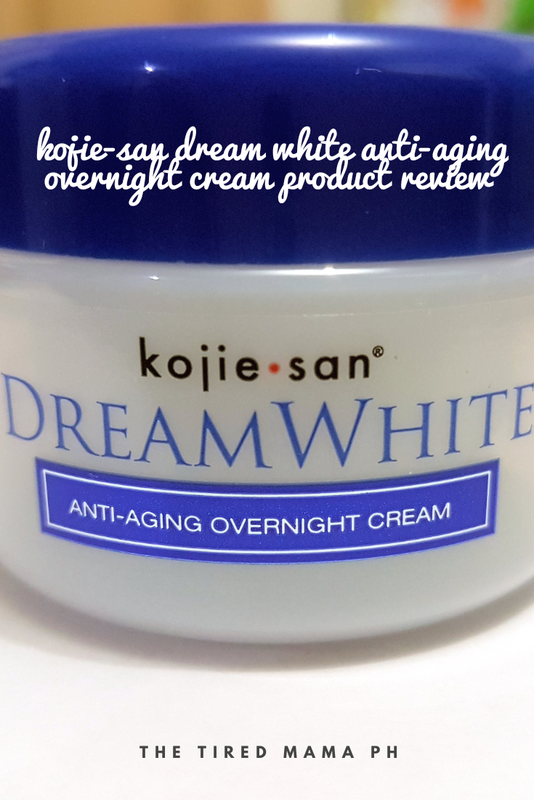 The Kojie-san Dream White Anti-aging Overnight Cream is a thick, white, emulsified cream that has a nice vanilla scent. 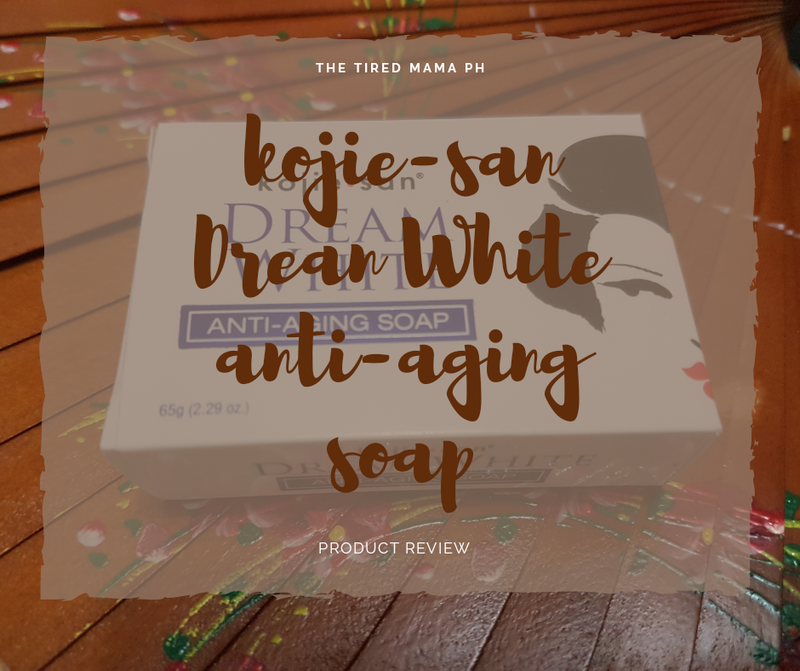 It is formulated with sodium hyaluronate, kojic acid, whey protein (MPC), soluble collagen and hydrolyzed elastin designed to lock in moisture and provide nourishment while combating aging. It goes on non-greasy and you can feel its moisturizing effects as soon as you put it on. Since I used to have really dry skin, the first time I applied this night cream, I had to lather it on thick. It felt as if its moisturizing effects were short-lived. This is the reason why I added the Skin Genie Blindspot Healing Stick to my bedtime regimen to add a little bit more ooomph. Now, my skin isn't dry anymore thanks to the combined effects of the two. I no longer have to lather it (the KS night cream) on thick. This is the reason why it has taken me 2 months to finish the small 30g plastic jar of Kojie-san Dream White Overnight cream. My skin also feels smooth and firm. The Milk Peptide Complex seems to work its magic. And I am happy to say, I did not experience an allergic reaction. One thing though, I have noticed I have become very pale or in Filipino terms, my skin has lightened. Yep, it whitens. At 165 Pesos, this overnight cream is a great buy. It moisturizes, lightens and maintains your skin's elasticity. For those who have sensitive skin like me, you can give the Kojie-san Dream White Overnight Cream a try. 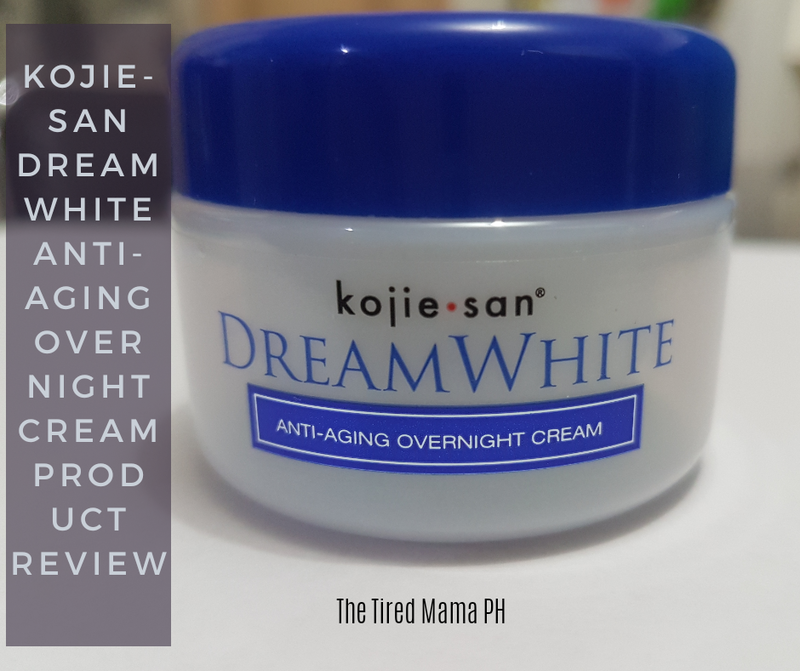 For budgeting moms on the lookout for an affordable night cream, I highly recommend the Kojie-san Dream White Anti-aging Overnight Cream. It's a beauty must-have to add to your bedtime routine so you can wake up to a radiant you!